April 11 | 2019. Liverpool. A Magical Mystery Tour. | Peter M. Schloss | J.D. - Mediator. April 11, 2019. Liverpool. A Magical Mystery Tour. Our second day in Middlewich provided us with an opportunity for an excursion to Liverpool and gave me a distraction from all things “canal”. Our B&B hostess, Liz, drove us to the rural train station and 30 minutes later we were walking the streets of Liverpool England. The Albert Dock area was amazing and steeped in the histories of the 18th Century slave trade, the 19th Century Irish Potato Famine, the loss of the Titanic, the sinking of the Lusitania, The War to End All Wars (which it did not), World War 2, and of course the events surrounding the births and careers of Liverpool’s most famous sons, The Beatles. Liverpool deserves a full day or two to do it justice. We were constrained to a half day, so after a bit of walking and abbreviated museum visits we signed up for the two hour “Magical Mystery (bus) Tour. We had been urged by a number of folks to do this. Kris and Chris were excited but I confess that I was less enthused, expecting nothing more than “kitch”. I was wrong and now stand counted as another proponent of the tour. 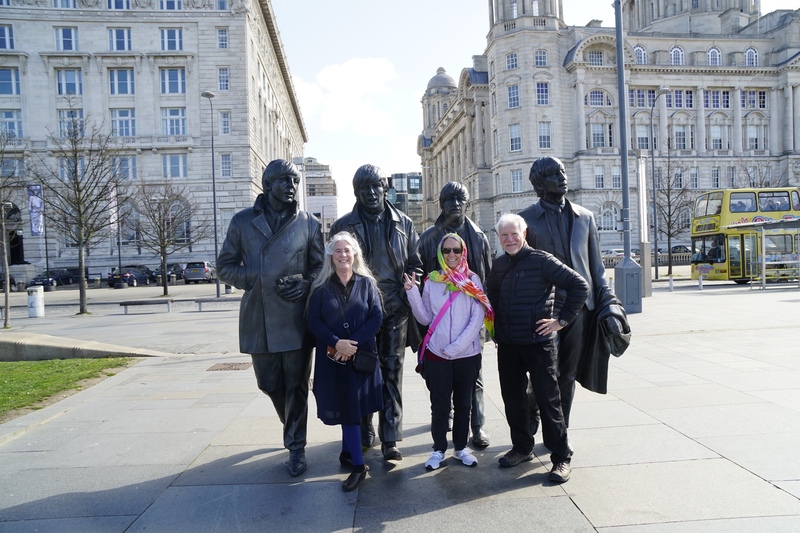 We visited the childhood homes of the “Fab Four”, drove through the neighborhoods they loved, and learned the biographical backgrounds of a number of their iconic hits such as “A Day In The Life”, “Strawberry Fields”, and of course “Penny Lane”. There was so much more, but well beyond the scope of a blog post. Should you come to England then make certain that Liverpool is on your itinerary. Returning to Middlewich we again walked the canal until we came to a lovely canal-side Pub, The King’s Lock, where a setting sun, picnic tables, and proper cask ale provided an opportunity to relax and make new friends. The friends were David and Jerri, a couple from a nearby community who are a year from retirement. In preparation they have purchased a motor home and are embracing dreams of monumental travel. Hmmm… sounds familiar! Finally, at the recommendation of David and Jerri we walked to another canal-side pub, The Big Lock, where excellent food and service provided the perfect end to a perfect day. Our canal adventure begins tomorrow. How fun, Peter! Thank you! We Love You, yeah yeah yeah!! Paul’s dad encouraged a rewrite to yes, yes, yes. Honest. That is hysterical and something my British Dad would have said too! I read the news today. Oh boy .. . The bus stop was a half block away, just around the corner. That’s why Paul made it in seconds flat. Ooohh, I want to be there too, I am a huuuuge Beatles-Fan! You would have really enjoyed it Irene! You are having a chance to enjoy Liverpool before you push off. Where wii you be on Easter? Can you disembark at any place or are you committed to special stops?? Enjoy! Be Safe. Mom, the canal is pretty much ours to travel. No special plans for Easter though. I will miss searching for your traditional Easter Baskets!